Well, here’s something to put a damper on our excitement for a Galaxy S9 with crazy small bezels. 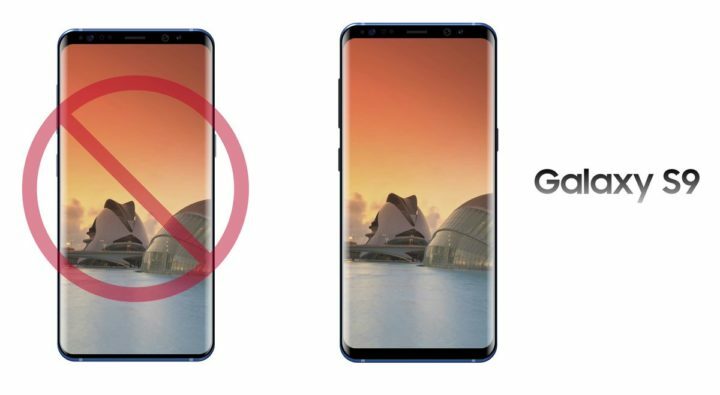 Ice Universe, the Twitter and Weibo leaker who has a mostly accurate track record with smartphone leaks, says that Samsung’s improved design for the Galaxy S9, which would have notably reduced the bezel above and below the screen compared to the Galaxy S8, has failed to “pass the test.” This design has apparently been “killed”, and the S9 is now expected to look mostly similar to its predecessor as far as the display and the bezel around it are concerned. Now, there was never any solid proof that the Galaxy S9’s screen-to-body ratio would surpass anything else that’s on the market, which is why we passed it off as a rumor back then. It’s also been said the aspect ratio on the S9 and S9+ displays would remain the same as seen on the Galaxy S8 and S8+, so it’s not surprising to hear that Samsung may be sticking to a similar design this time around. The back of the phone, then, is where the major changes would happen, including a re-positioning of the fingerprint sensor and two cameras instead of one for at least the plus-sized model. However, there’s a chance Ice Universe could be off the mark with his latest information, although at this point, we have to consider the fact that any new leaks and rumors may be based on the real deal as Samsung has no doubt finalized the design of the phone by now. The S9 may well turn out to be a more polished Galaxy S8, just like the S7 brought improvements to what Samsung had introduced with the Galaxy S6. We’re just going to have to wait and see to get a clearer picture of the Korean giant’s upcoming flagship(s). They should put a second speaker on that bottom chin to have front facing stereo speakers, that would be the perfect design IMO. Makes sense that the display design was finalized at this point, the S8’s back side design was finalized in mid-January and it launched a month late. This time the S9 is going to be announced in the end of February, so there’s a bit over two months until release. I think the ratio of the current S8s are fine, great, never had accidental touches and its a gorgeous display. I would be happy if it was the same. what matters more is the internals and the camera. and I say, there is plenty of bezel there for dual stereo front firing speakers! Might as well just buy an s8 at much cheaper price if it’s the same design, similar spec (single lense, single speaker, 4gb ram, presume similar batter size) and android o that will be released on s8. I admire your optimism regarding Android O on the S8 seeing as mine and most others S8 are still on Augusts patch and still no Bluebourne fix (unless you have beta). This is despite the fact that Samsung have updated loads of other “non” flagship devices. If we can’t be certain, we call it a rumor, even if the source of the story is our own. We’re not sure we’ve made that clear enough, though, so we’ll try to fix that for future articles. In my personal opinion, the present design and bezels of S8 and Note 8 series are ideal. Having all screen at the bottom would be even more difficult to operate due to reachability, changing your grip and shimmying everytime to reach the navigation bar would be very frustrating and not to mention accidentally touching the screen when using in landscape and watching videos.